Freshmen Caitie Listello, Hope Huelsmann, Jared Luebbers, Jacob Hitpas, and Claire Langenhorst served as Greeters for the Thanksgiving Mass held on November 23. 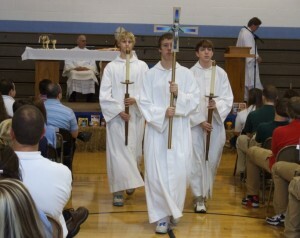 Joe Kasson, Adam Cowgill (with cross), and Connor Pollmann served as candle bearers and the cross bearer at the Thanksgiving Mass. 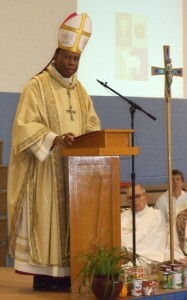 Bishop Braxton gave a reflective homily to those attending the Thanksgiving Mass. His Excellency The Most Reverend Edward Braxton, Bishop of Belleville, celebrated the annual Thanksgiving Mass at Mater Dei on Wednesday, November 23. Many students were involved in the Mass, including the Liturgical Planning Team, which plans and prepares the Mass, the Liturgical Music Group, which leads the singing, the Call to Worship student, cross bearers, candle bearers, gift bearers, ushers, greeters, Eucharistic ministers, sacristans, sound crew, set-up crew, tear-down crew, power point presenters, lector, and, with the Bishop celebrating Mass, the crosier and mitre servers.